Butter London is a favorite among nail polish lovers around the globe. The high-quality texture is long-lasting, and first and foremost non-toxic (free of formaldehyde, toluene, DBP, and parabens). But mostly, the brand is standing out because of its huge range of offbeat hues. Bluey – A slightly metallic dark peacock blue, perfect for fashionable birds. Toff – A darker, dustier, brownish variation on a rose pink. Stop to smell them. The roses, not the toffs. Knees Up – A smashing metallic red perfect for getting smashed in. Wallis – A tarnished, metallic olive gold, as mysterious and regal as its namesake. No More Waity, Katie – A soft, elegant greige shade with a splash of lilac glitter is the perfect marriage to combine fashion and fun. 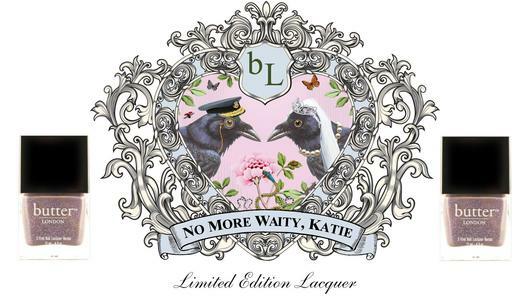 No More Waity, Katie had been especially created for the Royal Wedding last April and was supposed to be limited edition. Due its huge success, the beautiful hue will stay and be part of the F/W 2011 collection. Below you can see two of my favourite shades. For store locations, please click here (Unfortunately, Butter London is not yet available in Switzerland).